This sounds great, but now look at the next two columns. The actualization of these aspirations simply did not transfer. Using income as our primary filter, only 53 percent of low-income students matriculated to college immediately following high school graduation, and only 64 percent enrolled within two years of scheduled high school graduation. High-income students, comparatively, matriculated at an 87 percent rate, and 93 percent enrolled within two years of scheduled high school graduation. 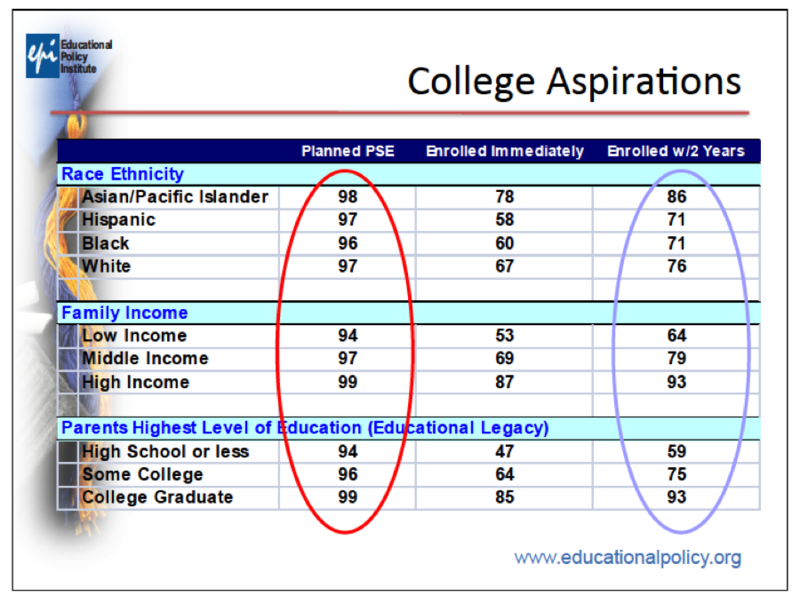 We see similar trends for educational legacy, where only 59 percent of students whose parents did not go to college were enrolled, compared to 93 percent of students who had at least one parent with a college degree. And by race/ethnicity, Asian students far surpassed all other students, and Black and Hispanic students had the lowest enrollment rates. Fast forward to a new study by ACT that suggests we aren’t doing any better today than in 1988. New data illustrates that 95 percent of ACT-tested low-income students wish to go to college but only 59 percent of those students immediately matriculate to postsecondary education. Further, only 69 percent of low-income, ACT-tested students took the recommended core high school curriculum, compared to 84 percent of high-income students. Additionally, only 20 percent of low-income students met at least three of the four ACT College Readiness Benchmarks, compared to 62 percent of high-income students. More distressing is that half (49 percent) of low-income students did not meet any of the benchmarks. ACT acknowledges that these large gaps between poor and affluent students is largely to do with “the disconnect between students’ plans for their educational future and their preparation to put those plans in action.” This is surely true. Many students and their families have not connected the dots to academic success by doing the right things at the right times, but the larger truth is that our education systems has similarly failed in reducing this gap. The ACT information is new, but it repeats the same reality of a quarter century ago to almost the same percentage point. Back in the late 1980s, we knew there were disconnects in the system, but over that much time we have not been able to reduce the gap in achievement by any single measure. The current negative dialogue about the common core state standards and testing around the country isn’t helping. To be fair, the common core is not a panacea for what ails low-income and other under-performing/prepared students, but it is a step in the right direction so at least we can diagnose ability and knowledge and put in systems to ameliorate these conditions. But now that more states are beginning to back away from the standards—and this has become a political juggernaut for many of these states—we are losing ground on trying to reduce gaps in preparation across the country. As I talk with experts about the common core, the exodus we see now may only register as a trickle once the first test results come out. Then, we will potentially see more states back away because the expected test results for students, especially low-income students, will be extremely low, playing solidly into common core critics. The truth is, backing away from the standards will likely push these states back in time, increasing gaps rather than decreasing them. By removing the standards, states, such as North Carolina, that say they will replace them with higher standards won’t. I believe these states will score even poorer because they will be working with a different set of standards—not higher—not better. But because they are different, they won’t be able to be compared with common core states. How politically convenient to put yourself in a position not to be compared. In the end, we will still compare on NAEP, but it won’t be the same. If states are really interested in removing gaps by income, race/ethnicity, and other factors, they would embrace the standards and use them as a comparative tool. They would embrace better tests that can be used diagnostically. They would embrace working together with other states to build better curriculum, better schools, and better teachers. But rejecting the common core state standards allows them not to do any of those things. And that is simply a shame for our youth. ACT defines the core curriculum as four years of English and three years each of mathematics, social studies and science.